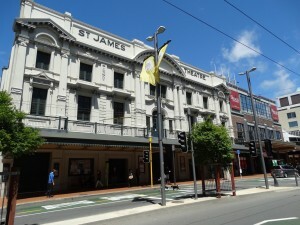 The St James Theatre, (previously known as His Majesty’s Theatre, and the Westpac St. James Theatre from 1997–2007) (shortened to “St. 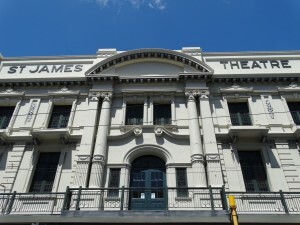 James” by locals) is a stage theatre located in the heart of NZ’s capital city, Wellington. The present theatre was designed in 1912 by Australian theatre designer Henry Eli White. 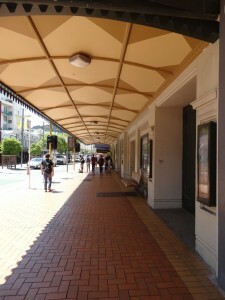 The theatre currently faces on to Courtenay Place, the main street of Wellington’s entertainment district, opposite the Reading Cinema complex. The building is number 83. The St. James has had a long history, with its success in its early years, a near demolition in the 1980s and to its return to the city’s cultural light in the late 1990s. The theatre’s land had been used as a church and volunteer hall prior to it being bought by the famous entertainer John Fuller on 23 December 1899. 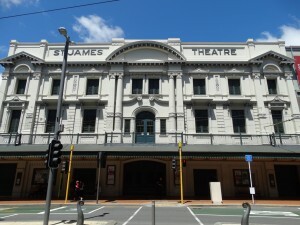 The St. James was made famous by Fuller, who had also built over 60 other theatres in New Zealand. He revamped the hall in 1903 and named it “His Majesty’s Theatre”, or nicknamed “Fuller’s”. During its use, the hall was host to pantomimes and a Cleopatra act, which involved the first and last import of snakes into New Zealand. However, Opera of any kind was seldom allowed by Fuller, who usually directed any opera show to Wellington’s Opera House down the road. Fuller used the old hall until November 1911, when it was eventually declared a fire hazard and demolished. After this demolition, Fuller vowed the new theatre he was going to build would be the best in New Zealand. Fuller enlisted the help of Henry Eli White, who had already designed other theatres around the country for Fuller. 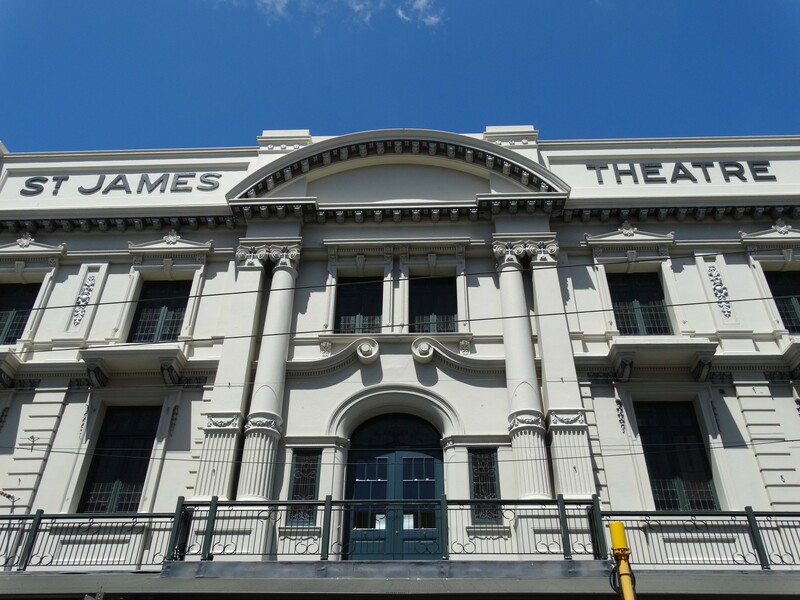 White, fresh from building theatres in Timaru and Auckland, set out to plan the St James. The St James theatre was the first entirely steel frame and reinforced concrete theatre in the world and plans made sure over 650 people could escape the auditorium in the event of a fire. Pillars in the auditorium were also kept at a minimum to allow perfect viewing, and seating was arranged in the arc of a circle to view the stage. The St. James was then adorned with marble pieces, carved face masks and cherubs to be placed on the ceiling and coloured glass. The plaster work was made by William Leslie Morrison, who reinforced the lime plaster with cow hair. Morrison used his grandson as a model for the plaster cherubs and modelled the full-figured seen near the stage after Bacchus and Apollo. The wooden floors of the St. James were made of rimu and jarrah, along with totara for window frames and deal for doors. After the plans had been set, construction began on the theatre in March 1912. To speed progress, White himself designed two electric cranes to lift the in excess of 500 tonnes of steel. In all, the St. James cost £32,000 to build and took 9 months to build. The theatre was officially opened 8pm on Boxing Day, 1912, by the Wellington Mayor, David McLaren. During the new theatre’s first months, it was used primarily to play silent movies. The St. James was changed nine months later to present live performances. However in 1930, after 17 years, it was again converted back to playing both movies and occasional live performances. This was after the St. James’s life long opposition, the Opera House began screening movies. After this change to the “talking films” or “flicks”, on 3 May 1930, His Majesty’s was closed and reopened as the St. James Theatre. Over the years, the St. James was slowly brought back to showing live performances. Many shows were performed at the venue; everything from Shakespeare, to minstrel acts to ballet. After Fuller died, the St. James passed through numerous owners. After its enormous success over the past decades, in the 1970s, the St. James theatre fell into decline and was effectively closed down. Shows began performing at the Opera House and newer venues such as the Michael Fowler Centre, Downstage and the restored town hall. Rumours of ghosts haunting upper seat levels didn’t help the theatre’s reputation either and soon the theatre was forgotten. On 7 May 1987, the St. James played its last movie, ‘Wanted: Dead or Alive”, to a small group. The site was then declared unpractical and was abandoned. The theatre was nearly demolished in the 1980s and ’90s after the owners placed a destruction order on the plot. However, due to the efforts of an objecting group, the St. James was eventually spared and restored to its former glory. The alarm had been risen after a photographer, Grant Sheehan, was told by the theatre’s curator that the St. James was set to be demolished by the Chase Corporation. For nearly a decade, a wrecking ball sat poised above the theatre, but it was never used after the owners were finally persuaded to save the property. The company looking to build on the site, Chase, were still angered by the result, so a trade-off was made by the committee vouching for the St. James; Chase would be allowed to build a tower in Wellington exceeding current height restrictions if the committee could save the theatre. The offer was highly contested, with some companies near the new tower protesting at its aimed size. The Opera House objected to the St. James’s restoration, saying that the city would not be able to sustain two theatres. In any case, the council rejected the committee’s proposal to allow Chase to build higher. Chase retaliated and immediately asked the council for a demolition permit. However, the council slowed progress on getting the report so the Historical Places Trust could add the St. James to its list. The plan succeeded and a limited protection order was placed over the St. James. Now Chase could only demolish the site with consent from the Trust. Knowing that the protection order would only last for a limited time (in fact only until 31 March 1988), there was a frantic rush to get Chase to sell the building to the council so they could restore it. Fundraising events were commonplace during this time, most asking for donations towards the “Save the St. James fund”. Eventually, after hard negotiations the plan to sell and restore the theatre went ahead, due to the theatre’s good aspects and proximity to the city’s hot-spots. Due to the increasing amount of theatre-going public, the Opera House would not be able to support the demand, especially when the Wellington Festival of the Arts arrived. The council finally agreed to allow Chase to plan its tower in Willis Street in return for $7 million to refurbish the theatre; the other option that was not taken was for the government to raise $18 million to purchase and restore the building. However, once again bad luck fell upon the deal, when the financial crash of 1987 struck most companies in New Zealand, including Chase. The building and deal were abandoned once again and time passed with no results. Chase hadn’t secured a tenant for its new tower and the council began to doubt whether it should spend millions on a single theatre. After the finish line for the protection order over the St. James ended, Chase gave their word that the theatre would not be demolished. Eventually, Chase went into liquidation and all its properties were put up for sale. The St. James was put on the market for $7 million, double what Chase had paid for it. The council declined and over the months, the price fell dramatically as Chase saw an absence of offers. The price fell to below what even Chase had paid for the theatre. The council still declined and a massive campaign to save the theatre arose. Eventually on 22 September 1993, the council sought to buy the property and succeeded with their offer of $550,000. The council handed the St. James over to a new St. James Theatre Charitable Trust. Soon it was booked out and live performances were shown frequently. An $18.5 million restoration plan was set out in 1995. However, this was considered worth the risk, as it was estimated the theatre would bring over $3.6 million into the local economy. In 1996, the council gave a $10.7 million contribution towards the restoration plan, in addition to $2.4 million from a Wellington Community Trust grant, $3.5 million from the Lottery Board and over $1 million in donation from the public. The total of around $17.7 million allowed the St. James Trust to confirm they would start restoring the theatre. Restoration work finished in late 1997. Most of the theatre’s aspects were modified, including the addition of “The Jimmy” a café on the theatre’s ground floor. “The Jimmy” was the nickname given to the St. James Theatre by technicians, thus the name was utilised. 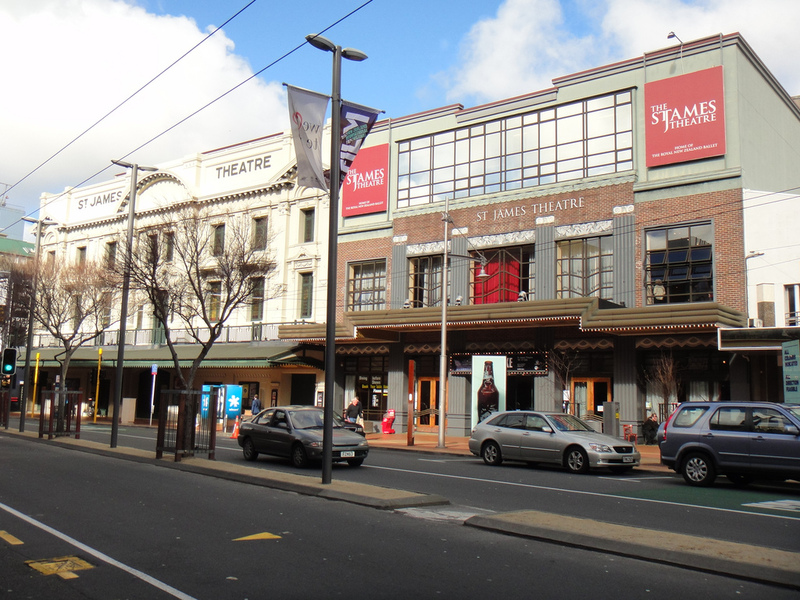 The St. James currently holds many shows and a large portion of the New Zealand International Arts Festival. 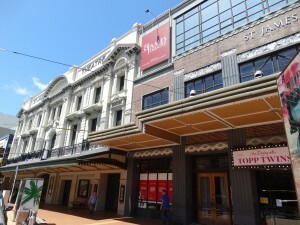 The building also hosts the Royal New Zealand Ballet. Art shows are often held on its second floor, as well as conferences. The theatre was also fitted with an orchestra pit, which is located many stories below the stage’s level. The bank operating in Australia and New Zealand, Westpac until 2007 held the naming rights to St. James, as well as other stadiums, including the Westpac Stadium, also in Wellington. A face-lift of the facade in 2007 included removing the Westpac name from the Brickwork frontage. There have been numerous reports of several spirits or ghosts in the St. James Theatre. One of the most seen ghosts is that of Yuri, a Russian performer who supposedly fell to his death from the flies several metres above the stage. Another account, more widely accepted, says he was pushed by a female named Pasha, also a Russian performer. Yuri has been encountered playing with the lights, especially turning them all back on again once cleaners have left for the night. One projectionist says Yuri saved his life twice. While on stage, the lights went out in the auditorium. While searching for the light switch, he was pushed backwards by what he believed was Yuri. The lights turned back on and the projectionist realised he was only inches from the orchestra pit and if he had not been pushed back, would have fallen in. The second time he says Yuri saved him was when he was on stage with his infant son. He suddenly heard a beam collapse above him. The projectionist insists he was pushed back by Yuri and that his son was “carried” through the air for about 3 metres. Other than Yuri, many other ghosts have been reported in the theatre. The “Wailing Woman” is a frequent apparition who is said to wail throughout the theatre. According to accounts, she was an actress trying to make a comeback. However, she was booed off stage. She later slit her wrists, either at home or in her dressing room. She is also said to be the cause of many of the odd occurrences surrounding lead actresses in plays performed at the St. James; many actresses performing on stage have sprained their ankle, one fell from a ladder, one suddenly caught a cold and was hoarse for her opera part. Another ghost is that of Stan Andrews. He is often heard wheezing around the backstage corridors at night, checking on his ushers. Also, a boy’s choir is said to haunt the auditorium. The choir played their last song at the St. James during World War ll before sailing off on tour. Their ship was never seen again and workers at the theatre often hear their music in the stands. However, when they investigate the sound, it moves to a separate part of the seats. The reason there is so much paranormal activity at the theatre is disputed, although there have been claims that the old choral hall was built on a cemetery or burial ground. This claim however, has never been proved. The paranormal activity of the St. James was investigated in 2005 on the New Zealand television show Ghost Hunt. The three investigators captured paranormal photographs and numerous ‘orbs’ inside the building and the elevator used suddenly began to malfunction which is a common among workers moving instruments from the orchestra pit to the loading bay. The programme also featured other haunted locations around New Zealand.